Davis Chevrolet GMC Buick, Airdrie, located just off the No. 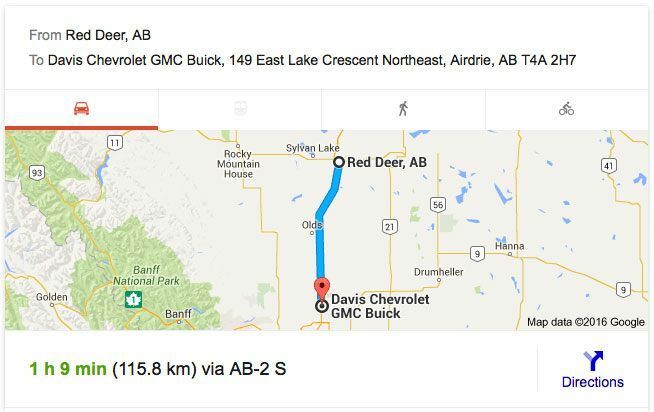 2 Highway at 149 East Lake Crescent N.E, Airdrie, is waiting to give our Red Deer car shoppers an awesome car buying and service experience. Our GM Dealership serving Red Deer is your best choice for everything Chevrolet GMC Buick, including new Chevrolet GMC Buick cars and all-make GM Certified Pre-Owned vehicles, GM Certified Service and repair, GM Parts, GM Accessories and more! We have one of the largest new and pre-owned car selections in central Alberta. Vehicle Rewards Account that can earn you up to $1000 off your next new or pre-owned vehicle purchase from Davis GM, Airdrie. Service Rewards Account that can save you money off the service and maintenance of your vehicle. 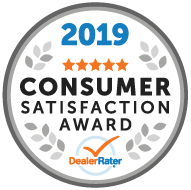 WE ARE RESPECTED: We belong to the esteemed Davis Automotive Group of dealerships, which have been doing business throughout Alberta for over 35 years. WE LOVE OUR EMPLOYEES: Our auto group has been recognized four years running at one of the Top 50 Best Employers in Canada, placing 13th in 2015. WE REWARD YOUR LOYALTY: Davis Airdrie offers a Dealer Rewards Program. 10% of service and parts purchases go back to you on a rewards card. WE CAN ACCESS INVENTORY: What you see on our lot is only the beginning of what is available to you. Any of our stores can pull and share inventory with another store. On average we have around 400 Pre-Owned Vehicles and 700 New Vehicles in the province. WE DELIVER: If you don’t live near us, that doesn’t mean you have to miss out on the Davis Difference. If you find your perfect vehicle in our On-Line Inventory, we can deliver it directly to you. THE DAVIS DIFFERENCE. WORTH THE DRIVE.